How many of you think we are in a bear market? I asked before I began my presentation at the Equitymaster Conference 2019. About 15-20 hands went up in the air. How many of you think that is good news? A few more hands went up this time around. I guess the ones who raised their hands were value investors to the core who were happy that markets were giving them a buying opportunity. But that's not the case with most investors. Markets have been under pressure for a few months now and most investors aren't happy the way their portfolios have bled. However, there are a few exceptions as well. I met a reserve member from Hyderabad who was attending the conference for the fourth time. He started investing in the markets in early 80's when the BSE Sensex was about 664. He said, I have seen multiple market cycles and atleast two mega-tops but never exited the markets on time. But this time around I exited on time from stocks especially midcaps and smallcaps. That's not all I moved that money in to HRITHIK stocks based on your recommendations and made money there as well. I congratulated him...but he had something more to share which excited me even more. I've moved out of HRITHIK stocks as well and invested that money in real estate which has almost doubled. I was extremely happy to hear this and shook his hand once again for the right decisions he made. It is feedback like this which motivates us to work harder and put forth the best of our research and insights so that you can make the right decisions. Now this gentleman asked whether it was the right time to put money back in to the markets. That's when I referred to the following chart which suggested that the bear market could be over in the next 3 months. Here I have Nifty and the net number of stocks hitting new 52 week highs daily. How do you get this number? Net number of stocks hitting new 52 week highs = Total number of stocks hitting new 52-week highs minus Total number of stocks hitting new 52 week lows. If this number is in the negative zone for most days in a row then we are in a bear market. If it is positive then we are in bull market. You will notice this number is in the negative zone most of the time since last 12 months which means more number of broader market stocks are hitting new 52-week lows than new highs. This suggests we are already in a bear market. And the good news is all the bear markets since 2008 have lasted anywhere between 9-15 months. It is said that the average mourning period when grieving the loss of a loved is not more than 15 months. The same rule applies to markets as well. Markets do not lament or remain in a bear trend for more than 15 months. The bear market which began last year is already 12 months old which means we may see a durable bottom form in a few of months from now. We could see the markets forming a bottom anywhere before June 2019. But before that happens we may see one more round of selling in stocks. But that shouldn't frighten traders and investors. Instead one should start preparing the shopping list of stocks one would like to buy for medium to long term. I have already prepared a list of stocks to watch out for and even shared it with the participants at the conference. You can access the watch list as well... all you have to do is sign up and keep reading my letters. PS: We're about to enter a period of increasing opportunities. Whether you are ready or not will make all the difference to your wealth. 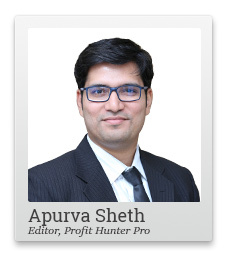 So step up, and sign up now for Apurva's brilliant premium recommendation newsletter. Click here now. Equitymaster requests your view! Post a comment on "This Bear Market Could End Before June 2019". Click here! 4 Responses to "This Bear Market Could End Before June 2019"
Sir, can't it be more than 15 months for bear phase to continue. And in how many months it will take new heights. The NIFTY 100 will go down in next one year. Baltic dry index shows condition of world economy which is very grim. In same way transportation sector in India shows the condition of Indian economy. What is the condition of CV makers and financiers like NBFCs? Is the market actually in bear phase. Has it corrected 20% from top. One can say broader market in bear phase.If nifty enters into bear phase, one can only imagine the level of small cap/midcap from here. The million dollar question is whether nifty will enter into bear phase or not.